Making your own face mask is an easy way to get healthier skin without exposing yourself to chemicals that may harm your skin. It is also much more economical to make your own mask than to buy one. DIY face masks using coconut oil will improve the look of your skin and while nourishing it with heathy vitamins and antioxidants. Coconut oil contains many compounds that make it great for your skin. Medium chain fatty acids protect skin against infection and acne, while medium chain triglycerides remove dirt and germs from pores. Vitamins E and C strengthen the skin's connective tissues and prevent sagging as well as killing the free radicals that can cause premature aging. A trio of acids, Lauric, Capric and Caprylic fight acne causing bacteria, microbes and viruses. Combined with other beneficial ingredients, a coconut oil face mask will make wrinkles less noticeable while it makes skin brighter. Dark circles under the eyes will be reduced, and skin will look and feel smoother. 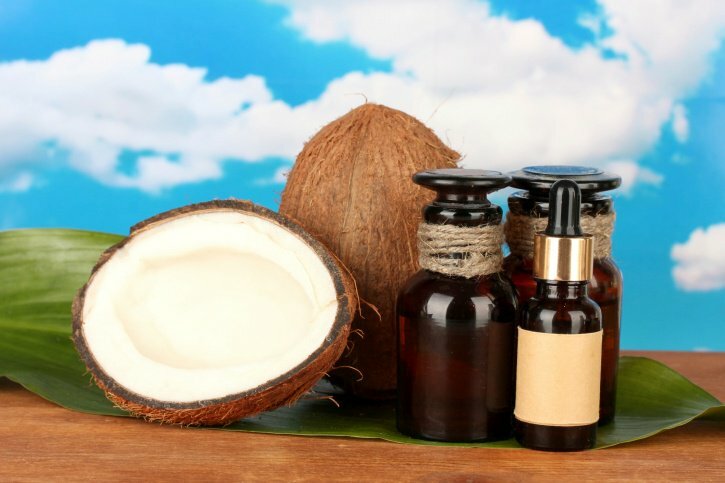 Here are two different recipes for DIY Coconut Oil Face Masks. Both nourish skin and make it smoother and brighter. In addition to the coconut oil, honey is a great moisturizer, fades acne scars and exfoliates skin cells. Lemon shrinks large pores and kills acne causing bacteria. Turmeric is a potent anti-inflammatory agent. 1. Put the turmeric in a small bowl. Stir in the honey. Add the milk and oil and stir until it becomes a smooth paste. Use one half now and refrigerate the remaining mixture, tightly covered, for up to 3 days. 2. Use some plain coconut oil to remove any makeup. Wash face and neck if desired and pat dry. Spread mixture evenly over cheeks, under eyes, and over nose, chin, and forehead. Leave on for 15 to 20 minutes, then rinse off with warm water and pat dry. 3. Apply toner to skin if desired, then moisturize with plain coconut oil. 1. Combine all ingredients into a paste in a small mixing bowl. 2. Apply onto clean face in a thick layer. 3. Leave on 10 minutes, then rinse off with cool water. Both of these DIY face masks can be made for well under a dollar and can be used 2-3 times a week. Biconi offers 100% Cold Pressed Virgin Coconut Oil for use as a natural makeup remover as well as in the DIY face masks recipes. If a further cleanser is desired, the Radiant Skin Facial Cleanser contains virgin coconut oil along with other beneficial plant extracts to cleanse skin naturally without any harsh chemicals. Radiant Skin Facial Cleanser comes in solid bar form and is available in a travel size as well.